The Surreal Trapdoor: Drunken Painting! My kid often leads me astray. She feels an overwhelming urge to educate me, an urge born out of anxious impatience with parental inertia with a soupcon of glee at my possible ineptitude. Despite feeling like a century-old sturgeon out of water at the things she’s shamed me into, sadly the experiences have enriched my life. Hell, I’ve survived dirt bike riding, horrific black diamond ski runs and now, drunken painting! 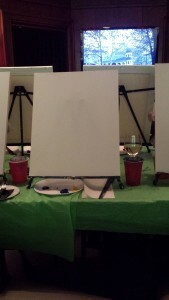 “Paint and sip” is win-win for everyone. Local bars and restos sell more alcohol and ladies get a novel girls’ night out. (Yes, 99.99% of the happy painters are women.) 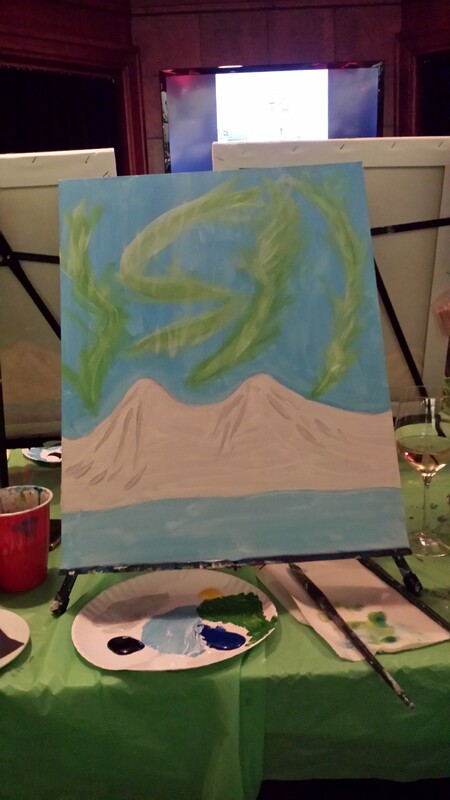 Not only do you get a scary bar bill at the end of the evening, you get to take home a scary painting, too! Fearing my child’s wrath if I opted for no-show, I dutifully arrived at Proof the Vodka Bar . Everyone on my mother’s side of the family is an artist, but those genes merrily skipped over me. I landed a mighty C- in art in elementary school and wisely chose science as a career. I dove into the “sip” part of the evening straight away. A tiny young woman was busy setting up 20 easels and blank canvases, covering the long table with green plastic sheets and depositing dabs of blue, yellow and white acrylic paint on paper plates. She seemed overwhelmed. We students donned aprons to protect our clothes from permanent souvenirs of the evening and took our seats, while listening to her dire warnings about rinsing off our brushes in our drinks instead of the cups of water provided. “Can you see the painting?” the lady next to me asked. “Um, no.” In fact none of us could. The set-up was proving less than ideal. 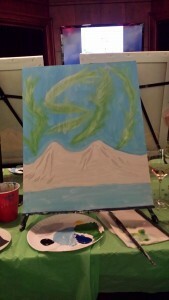 “First, paint the mountain,” the teacher announced. “There’s a mountain?” several of us echoed. “There’s a lake?” I downed more beer. Ah , yes, one thing I did remember from my C- art class was that yellow and blue make green. We all mixed and splashed away without benefit of further instruction. 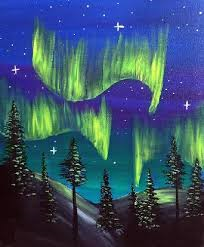 The northern lights soon proved to be everyone’s undoing. We looked at each other’s work and agreed that our efforts were irreparably cheesy. I ordered a second beer. “Now make trees!” The teacher circulated with the black paint she’d forgotten to dole out. That we could do. 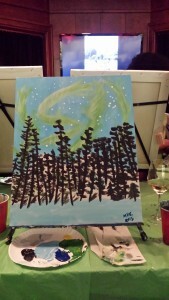 Trees were easy: lots of unfettered brush strokes. And more trees covered up more cheese. We asked for more black paint. The teacher got frustrated: she was running out. Bad idea. Or rather no idea how to make shadows. I made a half-assed effort, then erased everything with white paint leaving smudges of grey snow. “It’s good, um, good,” he replied, sounding like Banksy when confronted by his friend, Terry’s disastrously hopeless film in Exit Through the Gift Store. Hmm, that must be the happy black trees, but more likely the two beers. My masterpiece now proudly decorates our upper hallway and even better, our kid no longer insists that I take painting lessons.